Barbara Ann Corcoran was born on 10th March, 1949 in New Jersey. She is an investor, a speaker, syndicated columnist, consultant, television personality, author and a successful businesswoman. She is a “Shark” on the popular television show Shark Tank on ABC. Barbara attended St. Thomas Aquinas College and in 1971, she graduated with a degree in education. She worked as a teacher for one year and then took up other jobs in New York City. She had always wanted to be her own boss. Barbara was not an intelligent student in school. She used to earn D’s in high school and college. By the time she was 23, she had changed twenty jobs. But, it was her next job that made her a successful entrepreneur in the country. With a $1000 loan from her rich boyfriend, she started “The Corcoran Group”. In 1973, she co-founded “The Corcoran Group” which was a real estate business. By the mid-1970s, she had also started publishing “The Corcoran Report”. In 2001, she received a whopping $66 million after NRT Incorporated bought her business. It was the same business that she had co-founded with that $1000 loan she took from her boyfriend and turned it into an empire worth $66 million. Following this sale, she had become a prominent personality in the real estate sector in New York. After becoming a “Shark” investor, she has invested in a number of businesses till date. Being a columnist, she writes for “Redbook” The Daily Review” and “More Magazine”. She has authored several books and has appeared in a number of television shows. She has also spoken as a guest business speaker at a number of real estate events. Her latest book “Shark Tales” tells her life story and how she became successful. As an individual, Barbara is bold, brash and blunt, courageous and an identifier of talent and opportunity. When asked about her rags to riches story, she said that in order to achieve success, you should learn how to fail well. Her success story is highly motivational and entertaining. She is an expert in leading a team to success having led 1000 plus brokers in her company which is the largest real estate company in New York. She knows what it takes to develop a winning team and create a thriving workplace. In her books, she has shared her winning strategies. 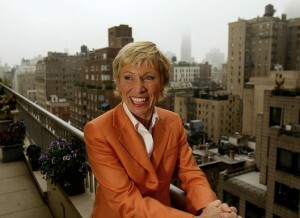 Barbara Corcoran is known to have built the most successful and largest real estate business in New York. She has revealed how she has actually done it. From creating a bigger image than it is in reality to using the press to achieve free publicity, she has shared everything that one needs to become a leader in their field.